This article is about the men's football club. For the women's football club, see Manchester City W.F.C. For the Sierra Leonean football club, see Manchester City F.C. (Sierra Leone). Manchester City Football Club is a football club based in Manchester, England, that competes in the Premier League, the top flight of English football. Founded in 1880 as St. Mark's (West Gorton), it became Ardwick Association Football Club in 1887 and Manchester City in 1894. The club's home ground is the City of Manchester Stadium in east Manchester, to which it moved in 2003, having played at Maine Road since 1923. The club won the Premier League in 2012, 2014 and, most recently in 2018, also becoming the first Premier League team to attain 100 points in a single season. Manchester City's revenue was the fifth highest of a football club in the world in the 2017–18 season at €527.7 million. In 2018, Forbes estimated the club was the fifth most valuable in the world at $2.47 billion. After being relegated to the Second Division in 1963, the future looked bleak with a record low home attendance of 8,015 against Swindon Town in January 1965. In the summer of 1965, the management team of Joe Mercer and Malcolm Allison was appointed. In the first season under Mercer, City won the Second Division title and made important signings in Mike Summerbee and Colin Bell. Two seasons later, in 1967–68, Manchester City claimed the League Championship for the second time, clinching the title on the final day of the season with a 4–3 win at Newcastle United and beating their close neighbours Manchester United into second place. Further trophies followed: City won the FA Cup in 1969, before achieving European success by winning the European Cup Winners' Cup in 1970, beating Górnik Zabrze 2–1 in Vienna. 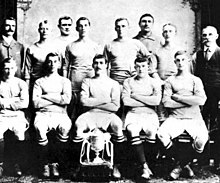 City also won the League Cup that season, becoming the second English team to win a European trophy and a domestic trophy in the same season. After relegation, the club underwent off-the-field upheaval, with new chairman David Bernstein introducing greater fiscal discipline. Under manager Joe Royle, City were promoted at the first attempt, achieved in dramatic fashion in a play-off against Gillingham. A second successive promotion saw City return to the top division, but this proved to have been a step too far for the recovering club, and in 2001 City were relegated once more. Kevin Keegan replaced Royle as manager in the close season, and achieved an immediate return to the top division as the club won the 2001–02 Division One championship, breaking club records for the number of points gained and goals scored in a season in the process. The 2002–03 season was the last at Maine Road, and included a 3–1 derby victory over rivals Manchester United, ending a run of 13 years without a derby win. City also qualified for European competition for the first time in 25 years. In the 2003 close season, the club moved to the new City of Manchester Stadium. The first four seasons at the stadium all resulted in mid-table finishes. Former England manager Sven-Göran Eriksson became the club's first manager from overseas when appointed in 2007. After a bright start, performances faded in the second half of the season, and Eriksson was sacked in June 2008. Eriksson was replaced by Mark Hughes two days later on 4 June 2008. By 2008, the club was in a financially precarious position. Thaksin Shinawatra had taken control of the club a year before, but his political travails saw his assets frozen. 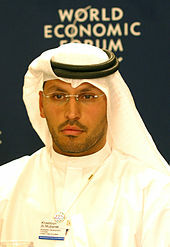 Then, in August 2008, the club was purchased by the Abu Dhabi United Group. The takeover was immediately followed by a flurry of bids for high-profile players; the club broke the British transfer record by signing Brazilian international Robinho from Real Madrid for £32.5 million. There wasn't a huge improvement in performance compared to the previous season despite the influx of money however, with the team finishing tenth, although they did well to reach the quarter-finals of the UEFA Cup. During the summer of 2009, the club took transfer spending to an unprecedented level, with an outlay of over £100 million on players Gareth Barry, Roque Santa Cruz, Kolo Touré, Emmanuel Adebayor, Carlos Tevez and Joleon Lescott. In December 2009, Mark Hughes – who had been hired shortly before the change in ownership but was originally retained by the new board – was replaced as manager by Roberto Mancini. City finished the season in fifth position in the Premier League, narrowly missing out on a place in the Champions League, and competed in the UEFA Europa League in season 2010–11. Continued investment in players followed in successive seasons, and results began to match the upturn in player quality. City reached the 2011 FA Cup Final, their first major final in over 30 years, after defeating derby rivals Manchester United in the semi-final, the first time they had knocked their rival out of a cup competition since 1975. They defeated Stoke City 1–0 in the final, securing their fifth FA Cup, the club's first major trophy since winning the 1976 League Cup. In the same week, the club qualified for the UEFA Champions League for the first time since 1968 with a 1–0 Premier League win over Tottenham Hotspur. On the last day of the 2010–11 season, City passed Arsenal for third place in the Premier League, thereby securing qualification directly into the Champions League group stage. Manchester City moved into their new complex at the Etihad Campus adjacent to the City of Manchester Stadium in 2014. Strong performances continued to follow in the 2011–12 season, with the club beginning the following season in commanding form, including beating Tottenham 5–1 at White Hart Lane and humbling Manchester United by a 6–1 scoreline in United's own stadium. Although the strong form waned halfway through the season, and City at one point fell eight points behind their arch rivals with only six games left to play, a slump by United allowed the blue side of Manchester to draw back level with two games to go, setting up a thrilling finale to the season with both teams going into the last day equal on points. Despite City only needing a home win against a team in the relegation zone, they fell a goal behind by the end of normal time, leading some of United's players to finish their game celebrating in the belief that they had won the league. Two goals in injury time – including one scored almost five minutes after normal time had elapsed – resulted in an almost-literal last-minute title victory, City's first in 44 years, and became only the fifth team to win the Premier League since its creation in 1992. In the aftermath that followed, the event was described by media sources from the UK and around the world as the greatest moment in Premier League history. The game was also notable for former player Joey Barton's sending off, where he committed three separate red card-able incidents on three different players in the space of only a couple of seconds, resulting in a 12-match ban. The following season City failed to capitalise on the gains made in the first two full seasons of Mancini's reign. While City rarely seemed likely to drop below second in the table, they posed little title challenge all season. In the Champions League, the club was eliminated at the group stage for a second successive season, while a second FA Cup final in three seasons ended in a 1–0 defeat to relegated Wigan Athletic. Mancini was dismissed two days later, ostensibly as he had failed to reach his targets for the season, but BBC Sports Editor David Bond reported he had been sacked for his poor communication and relationships with players and executives. In his place was appointed the Chilean Manuel Pellegrini. In Pellegrini's first season, City won the League Cup and regained the Premier League title on the last day of the season. Manchester City won the 2017–18 Premier League title. The club had the highest point total in Premier League history and broke numerous Club and English league records in that season. That season, they also won the EFL Cup, and won it the season after, which was the first time in Manchester City history that the club retained a major trophy. Pep Guardiola, former manager of Barcelona and Bayern Munich, is the current manager, who has been in charge since the dismissal of Pellegrini in 2016. Manchester City's stadium and shirt have been sponsored by Etihad Airways since 2009. Wikimedia Commons has media related to Manchester City F.C. kits. City have previously worn three other badges on their shirts, prior to their current badge which was implemented in 2016. The first, introduced in 1970, was based on designs which had been used on official club documentation since the mid-1960s. It consisted of a circular badge which used the same shield as the current badge, inside a circle bearing the name of the club. In 1972, this was replaced by a variation which replaced the lower half of the shield with the red rose of Lancashire. On occasions when Manchester City plays in a major cup final, the usual badge has not been used; instead shirts bearing a badge of the arms of the City of Manchester are used, as a symbol of pride in representing the city of Manchester at a major event. This practice originates from a time when the players' shirts did not normally bear a badge of any kind, but has continued throughout the history of the club. For the 2011 FA Cup Final, City used the usual badge with a special legend, but the Manchester coat of arms was included as a small monochrome logo in the numbers on the back of players' shirts. A new club badge was adopted in 1997, as a result of the previous badge being ineligible for registration as a trademark. This badge was based on the arms of the city of Manchester, and consisted of a shield in front of a golden eagle. The eagle is an old heraldic symbol of the city of Manchester; a golden eagle was added to the city's badge in 1958 (but has since been removed), representing the growing aviation industry. The shield features a ship on its upper half representing the Manchester Ship Canal, and three diagonal stripes in the lower half symbolise the city's three rivers – the Irwell, the Irk and the Medlock. The bottom of the badge bears the motto "Superbia in Proelio", which translates as "Pride in Battle" in Latin. Above the eagle and shield are three stars, which are purely decorative. On 15 October 2015, following years of criticism from the fans over the design of the 1997 badge, the club announced they intended to carry out a fan consultation on whether to disregard the club badge and institute a new design. After the consultation, the club announced in late November 2015 the current club badge would be replaced in due course by a new version which would be designed in the style of the older, circular variants. A design purporting to be the new badge was unintentionally leaked two days early prior to the official unveiling on 26 December 2015 by the IPO when the design was trademarked on 22 December. The new design was officially unveiled at the club's home match on 26 December against Sunderland. Since 2003, Manchester City have not issued the squad number 23. It was retired in memory of Marc-Vivien Foé, who was on loan to the club from Lyon at the time of his death on the field of play while playing for Cameroon in the 2003 FIFA Confederations Cup. Last updated: 11 November 2018. Since moving to the City of Manchester Stadium, Manchester City's average attendances have been in the top six in England, usually in excess of 40,000. Even in the late 1990s, when the club were relegated twice in three seasons and playing in the third tier of English football (then Division Two, now Football League One), home attendances were in the region of 30,000, compared to an average for the division of fewer than 8,000. Research carried out by Manchester City in 2005 estimates a fanbase of 886,000 in the United Kingdom and a total in excess of 2 million worldwide, although since the purchase of the club by Sheikh Mansour and the club's recent trophies, that figure has ballooned to many times that size. Manchester City's officially recognised supporters club is the Manchester City F.C. Supporters Club (1949), formed from a merger of two existing organisations in 2010: the Official Supporters Club (OSC) and the Centenary Supporters Association (CSA). There have been several fanzines published by supporters; the longest running is King of the Kippax and it is the only one still published. The City fans' song of choice is a rendition of "Blue Moon", which despite its melancholic theme is belted out with gusto as though it were a heroic anthem. City supporters tend to believe that unpredictability is an inherent trait of their team, and label unexpected results "typical City". Events that fans regard as "typical City" include City's being the only reigning English champions ever to be relegated (in 1938), the only team to score and concede over 100 goals in the same season (1957–58), or the more recent example that City were the only team to beat Chelsea in the 2004–05 Premier League, yet in the same season City were knocked out of the FA Cup by Oldham Athletic, a team two divisions lower. Manchester City's biggest rivalry is with neighbours Manchester United, against whom they contest the Manchester derby. Before the Second World War, when travel to away games was rare, many Mancunian football fans regularly watched both teams even if considering themselves "supporters" of only one. This practice continued into the early 1960s but as travel became easier, and the cost of entry to matches rose, watching both teams became unusual and the rivalry intensified. A common stereotype is that City fans come from Manchester proper, while United fans come from elsewhere. A 2002 report by a researcher at Manchester Metropolitan University found that while it was true that a higher proportion of City season ticket holders came from Manchester postcode areas (40% compared to United's 29%), there were more United season ticket holders, the lower percentage being due to United's higher overall number of season ticket holders (27,667 compared to City's 16,481). The report noted that since the compiling of data in 2001, the number of both City and United season ticket holders had risen; expansion of United's ground and City's move to the City of Manchester Stadium have caused season ticket sales to increase further. Man City also has a rivalry with that of Everton F.C. In the late 1980s, City fans started a craze of bringing inflatable objects to matches, primarily oversized bananas. One disputed explanation for the craze is that in a match against West Bromwich Albion chants from fans calling for the introduction of Imre Varadi as a substitute mutated into "Imre Banana". Terraces packed with inflatable-waving supporters became a frequent sight in the 1988–89 season as the craze spread to other clubs (inflatable fish were seen at Grimsby Town), with the phenomenon reaching a peak at City's match at Stoke City on 26 December 1988, a match declared by fanzines as a fancy dress party. In 2010, City supporters adopted an exuberant dance, dubbed The Poznań, from fans of Polish club Lech Poznań. On 23 January 2014 it was announced that Manchester City had partnered with the Australian rugby league franchise Melbourne Storm, purchasing a majority stake in A-League team Melbourne City FC. On 5 August 2015, CFG bought out the Storm and so acquired full ownership of the team. On 21 May 2013 it was announced that Manchester City had partnered with the American baseball franchise the New York Yankees to introduce the 20th Major League Soccer expansion team, New York City FC as its majority shareholder. The club began play in the 2015 Major League Soccer season. On 5 April 2017, CFG confirmed the purchase of Uruguayan second division team Club Atlético Torque. On 23 August 2017 it was announced that the City Football Group had acquired 44.3% of La Liga side Girona FC. Another 44.3% was held by the Girona Football Group, led by Pere Guardiola, brother of Manchester City manager Pep Guardiola. The City of Manchester Stadium in east Manchester, known as the Etihad Stadium since 2011 for sponsorship reasons, is on a 200-year lease from Manchester City Council. It has been City's home since the end of the 2002–03 season, when the club moved from Maine Road. 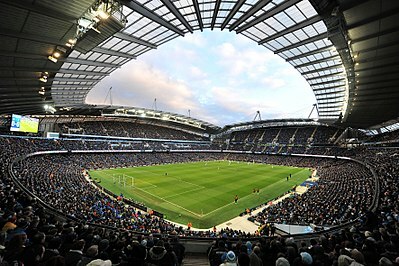 Before moving to the stadium, Manchester City spent in excess of £30 million to convert it to football use. The pitch was lowered, adding another tier of seating around it, and a new North Stand built. The inaugural match at the new stadium was a 2–1 win over Barcelona in a friendly match. A 7,000-seat third tier on the South Stand was completed in time for the start of the 2015–16 football season. Current capacity stands at 55,097. A North Stand third tier has planning approval and work on it is expected to begin by 2017, increasing capacity to around 61,000. After playing home matches at five stadiums between 1880 and 1887, the club settled at Hyde Road Football Stadium, its home for 36 years. A fire destroyed the Main Stand in 1920, and the club moved to the 84,000 capacity Maine Road three years later. Maine Road, nicknamed the "Wembley of the North" by its designers, hosted the largest-ever crowd at an English club ground when 84,569 attended an FA Cup tie against Stoke City on 3 March 1934. Though Maine Road was redeveloped several times over its 80-year lifespan, by 1995 its capacity was restricted to 32,000, prompting the search for a new ground which culminated in the move to the City of Manchester Stadium in 2003. Buckley, Andy; Burgess, Richard (2000). Blue Moon Rising: The Fall and Rise of Manchester City. Bury: Milo. ISBN 0-9530847-4-4. Gardner, Peter (1970). The Manchester City Football Book No. 2. London: Stanley Paul. ISBN 0-09-103280-6. Inglis, Simon (1987). The Football Grounds of Great Britain (2nd ed.). London: Collins Willow. ISBN 0-00-218249-1. James, Gary (2002). Manchester: The Greatest City. Polar Publishing. ISBN 1-899538-09-7. James, Gary (2005). The Official Manchester City Hall of Fame. Hamlyn. ISBN 0-600-61282-1. James, Gary (2006). Manchester City – The Complete Record. Derby: Breedon. ISBN 1-85983-512-0. Penney, Ian (2008). Manchester City: The Mercer-Allison Years. Derby: Breedon. ISBN 978-1-85983-608-8. Rowlands, Alan (2005). Trautmann: The Biography. Derby: Breedon. ISBN 1-85983-491-4. Tossell, David (2008). Big Mal: The High Life and Hard Times of Malcolm Allison, Football Legend. Edinburgh: Mainstream. ISBN 978-1-84596-478-8. Wallace, David (2007). Century City – Manchester City Football Club 1957/58. Leigh: King of the Kippax. ISBN 978-0-9557056-0-1. Ward, Andrew (1984). The Manchester City Story. Derby: Breedon. ISBN 0-907969-05-4. ^ On 16 April 1894, the name was changed to Manchester City. ^ "Manchester City F.C. Club Ownership". Manchester City F.C. Retrieved 23 October 2017. ^ Ozanian, Mike. "The World's Most Valuable Soccer Teams 2018". Forbes. Retrieved 12 June 2018. ^ "Club History – The Club – Manchester City FC". mancity.com. Retrieved 9 September 2010. ^ Bevan, Chris (11 May 2003). "Maine Road through the ages". BBC Sport. Retrieved 10 September 2011. ^ James, Gary (22 April 2011). "FA Cup special: Thrills, spills and a cast of thousands at Maine Road". menmedia.co.uk. Archived from the original on 12 November 2012. Retrieved 23 April 2011. ^ "England 1937/38". league table from RSSSF. Retrieved 29 December 2005. ^ Other results meant United would have been relegated even if they had won or drawn, but neither team knew this at the time. ^ "Goater double gives City derby win". RTÉ. Archived from the original on 19 December 2007. Retrieved 28 May 2007. ^ "Eriksson named Man City manager". BBC Sport. 6 July 2007. Retrieved 20 July 2007. ^ "Eriksson's reign at Man City ends". BBC Sport. 2 June 2008. Retrieved 2 June 2008. ^ "Manchester City appoint Mark Hughes". Manchester City F.C. 4 June 2008. Retrieved 21 October 2009. ^ Winrow, Ian (12 August 2008). "Thaksin Shinawatra's crisis ends Manchester City's European dream". Daily Telegraph. London. Retrieved 4 September 2010. ^ "Man City beat Chelsea to Robinho". BBC. 1 September 2008. Retrieved 19 September 2009. ^ "Lescott completes Man City move". BBC Sport. 25 August 2009. Retrieved 12 September 2009. ^ "Mark Hughes sacked as Man City appoint Mancini manager". BBC Sport. 19 December 2009. Retrieved 19 December 2009. ^ "Man City 1 – 0 Man Utd". BBC Sport. 16 April 2011. ^ "Man City 1 – 0 Tottenham". BBC Sport. 10 May 2011. Retrieved 10 May 2011. ^ "Is Man City's title win really the best Premier League moment ever? See the Top 50 here.. and then tell us yours". Daily Mirror. London. 9 August 2012. Retrieved 7 October 2013. ^ "Reconstructing The Most Exciting Day in the History of Soccer (And Maybe Sports, Period)". deadspin.com. 16 May 2012. Retrieved 7 October 2013. ^ "Barton blow as bad boy is told he must serve ban at new club Marseille". Daily Mail. London. 6 September 2012. Retrieved 7 October 2013. ^ "REVEALED: Bitter dressing room battles that sealed the fate of preening Mancini". Daily Mail. London. 17 May 2013. Retrieved 7 October 2013. ^ "Roberto Mancini: Manchester City sack manager". BBC Sport. 14 May 2013. Retrieved 19 April 2017. ^ "Roberto Mancini: Man City exit because of poor relationships". BBC Sport. 14 May 2013. Retrieved 7 October 2013. ^ "Manuel Pellegrini: Manchester City appoint Chilean as manager". BBC Sport. 12 June 2013. Retrieved 7 October 2013. ^ O'Rourke, Pete (2 March 2014). "Capital One Cup final: Manchester City win Capital One Cup after beating Sunderland 3–1". Sky Sports News. Retrieved 11 May 2014. ^ "Manchester City crowned Premier League champions with 2–0 victory over West Ham". Sky Sports. 11 May 2014. Retrieved 11 May 2014. ^ "Man City smash 11 Premier League records". ESPN. Retrieved 24 June 2018. ^ Turner, Georgina (23 November 2005). "Nicking the shirts off their backs". The Guardian. London. Retrieved 18 December 2006. ^ "Manchester City History". Retrieved 19 April 2017. ^ a b "City's New Badge is Here!". mancity.com. 2 July 2016. Retrieved 19 April 2017. ^ "Manchester City to design new badge following consultation with fans". The Guardian. 24 November 2015. Retrieved 19 April 2017. ^ "Manchester City's new club badge design leaked online". BBC News. 24 December 2015. Retrieved 24 December 2015. ^ McVeigh, Niall (26 December 2015). "Manchester City unveil new club crest before home game against Sunderland". The Guardian. Retrieved 26 December 2015. ^ "Squads: Mens' team". Manchester City F.C. Retrieved 22 July 2018. ^ a b c "Man City squad numbers for 2017/18 season". Manchester City F.C. Retrieved 23 July 2018. ^ a b Hafez, Shamoon. "Leicester City 1–1 Manchester City (4–3 pens)". BBC Sport. Retrieved 23 July 2018. ^ a b McNulty, Phil. "Chelsea 5–1 Manchester City". BBC Sport. Retrieved 23 July 2018. ^ "Leicester v Man City". BBC Sport. Retrieved 18 December 2018. ^ a b "Burton v Man City". BBC Sport. Retrieved 23 January 2019. ^ Bevan, Chris. "Community Shield: Chelsea 0–2 Manchester City – Sergio Aguero scores twice". BBC Sport. Retrieved 5 August 2018. ^ David Clayton (25 September 2018). "Oxford United v Manchester City Match Report". Manchester City F.C. Retrieved 22 October 2018. ^ "Man City retire number 23 shirt". BBC Sport. 27 June 2003. Retrieved 22 July 2018. ^ "50 YEARS OF MCFC PLAYER OF THE YEAR: PART 1". Retrieved 12 July 2017. ^ "50 YEARS OF MCFC PLAYER OF THE YEAR: PART 2". Retrieved 12 July 2017. ^ "50 YEARS OF MCFC PLAYER OF THE YEAR: PART 3". Retrieved 12 July 2017. ^ "50 YEARS OF MCFC PLAYER OF THE YEAR: PART 4". Retrieved 12 July 2017. ^ "50 YEARS OF MCFC PLAYER OF THE YEAR: PART 5". Retrieved 12 July 2017. ^ "Starting line-up inducted into City Hall of Fame". Manchester Evening News. 23 January 2004. Archived from the original on 12 November 2012. Retrieved 30 March 2011. ^ "King Ken collects plaudits". Manchester Evening News. 9 February 2005. Archived from the original on 24 May 2011. Retrieved 30 March 2011. ^ "City legends honoured". Manchester Evening News. 22 February 2006. Archived from the original on 12 November 2012. Retrieved 30 March 2011. ^ "Academy honoured at Hall of Fame". mancity.com. (Manchester City Football Club). 6 March 2008. Retrieved 19 April 2017. ^ "City Greats go into Hall of Fame". mancity.com. (Manchester City Football Club). 16 September 2009. Retrieved 19 April 2017. ^ "Managers". mcfcstats.com. Retrieved 29 March 2006. ^ "Top 30 English Football Clubs by League Attendances". footballeconomy.com attendance table 2002–2005. Retrieved 30 December 2005. ^ "Average Attendances – English Football Divisions – 1994/95–2004/05". footballeconomy.com division attendance table 1995–2005. Retrieved 30 December 2005. ^ "About MCFC Supporters Club". MCFC Supporters Club. Archived from the original on 30 October 2016. Retrieved 19 April 2017. ^ "King of the Kippax fanzine". Archived from the original on 8 July 2011. Retrieved 13 March 2010. ^ "Typical City!". Unofficial supporters homepage. Archived from the original on 11 January 2006. Retrieved 25 March 2006. ^ "Do You Come From Manchester?" (PDF). Manchester Metropolitan University study. Archived from the original (PDF) on 27 February 2008. Retrieved 9 January 2008. ^ "Everton – Manchester City: A Historical Look". Sb Nation.com. ^ "The Inflatables Craze". Manchester City Football Club Supporters' Homepage. Archived from the original on 23 April 1999. Retrieved 30 December 2005. ^ Pitt-Brooke, Jack (20 April 2011). "Poles apart: how fans of Poznan inspired City's unlikely dance craze". The Independent. London. Retrieved 7 November 2011. ^ "Manchester City plc". PLUS Markets Group. Archived from the original on 5 February 2007. Retrieved 30 April 2007. ^ "Thaksin completes Man City buyout". BBC News. 6 July 2007. Retrieved 6 July 2007. ^ Taylor, Daniel (10 April 2009). "Wardle quits City". The Guardian. UK. Retrieved 28 August 2008. ^ "Manchester City's losses trebled under Thaksin Shinawatra". The Telegraph. Retrieved 19 April 2017. ^ "Eriksson continues Man City spending". Reuters. 2 August 2007. Retrieved 13 January 2008. ^ "Bojinov joins Man City". FIFA. Retrieved 13 January 2008. ^ Montague, James (1 September 2008). "Manchester City's new owners put national pride before profit". The Guardian. UK. Retrieved 1 April 2011. ^ "City Takeover Confirmed". Sky Sports. Retrieved 9 January 2008. ^ "Man City beat Chelsea to Robinho". bbc.co.uk. (Manchester City Football Club). 1 September 2008. Retrieved 19 April 2017. ^ "English Transfer Window Ends With Man City As Biggest Spenders". goal.com. Retrieved 2 September 2009. ^ "The resources and power of Sheikh Mansoor makes this deal a seismic moment for the A-League". Herald Sun. 23 January 2014. Retrieved 23 January 2014. ^ John Stensholt (2 August 2015). "Manchester City buy out wealthy Melbourne City investors". Australian Financial Review. Retrieved 5 August 2015. ^ "Manchester City Pre-Season Tour 2016" (PDF). mancity.com. Retrieved 19 April 2017. ^ "New Soccer Team Introduces a Director of Operations". New York Times. 22 May 2013. Retrieved 22 May 2013. ^ "CFG Extends South American Footprint". Manchester City Official Website. 5 April 2017. Retrieved 5 April 2017. ^ "Manchester City's parent company seals deal for major stake in Girona". The Guardian. 23 August 2017. Retrieved 24 August 2017. ^ Bailey, Chris (8 November 2006). "Why Blues must cash in on name game". Manchester Evening News. Archived from the original on 14 October 2009. Retrieved 22 April 2008. ^ James, Manchester: A Football History, p391. ^ "Man City vanquish Barca". BBC article. 10 August 2003. Retrieved 28 December 2005. ^ "Manchester City seek stadium expansion to hold 61,000". Manchester: BBC News. 11 October 2013. Retrieved 29 December 2013. ^ "Club History". Manchester City F.C. Retrieved 19 April 2017. ^ a b c Up until 1992, the top division of English football was the Football League First Division; since then, it has been the FA Premier League. At the same time, the Second Division was renamed the First Division, and the Third Division was renamed the Second Division. ^ "Sergio Agüero". Manchester City F.C. Archived from the original on 16 February 2018. Retrieved 17 February 2018. ^ Jamie Jackson (10 July 2018). "Manchester City seal £60m deal for Leicester's Riyad Mahrez". The Guardian (Press release). ^ "Kelechi Iheanacho completes £25 million Leicester switch – sources". ESPN FC. 1 August 2017. Retrieved 10 September 2017.